﻿ John 20:31 But these have been recorded in order that you may believe that He is the Christ, the Son of God, and that, through believing, you may have Life through His name. 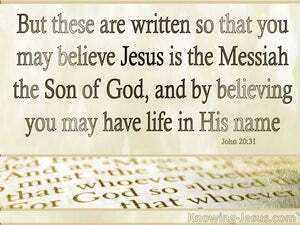 But these are written, so that ye may believe that Jesus is the Christ, the Son of God, and that believing ye may have life in his name. But these are written (recorded) in order that you may believe that Jesus is the Christ (the Anointed One), the Son of God, and that through believing and cleaving to and trusting and relying upon Him you may have life through (in) His name [ through Who He is]. But these [signs] are written down so that you will believe that Jesus is the Christ, the Son of God, and that when you believe [this], you will have [never ending] life in His name [i.e., through His person and work]. but these are written, that you may believe that Jesus is the Christ, the Son of God, and that by believing you may have life through his name. but these are written, that ye might believe that Jesus is the Messias, the son of God, and that believing ye might have life through his name. and these have been written in order that you may believe that Jesus Christ is the Son of God; and in order that believing you may have life through His name. But these have been recorded so that you may believe that Jesus is the Christ, the Son of God, and through believing you may have life as his followers. 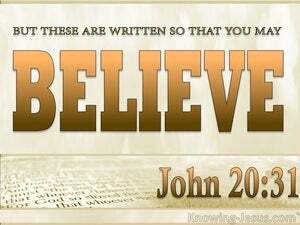 But these are written, that ye may believe that Jesus is the Christ, the Son of God, and that believing ye may have life thro' his name. But these have been written, that ye might believe that Jesus is Christ, the Son of God; and that believing ye might have life in his name. but these [things] are recorded in order that you may believe that Jesus is the Christ, the Son of God, and that [by] believing you may have life in his name. 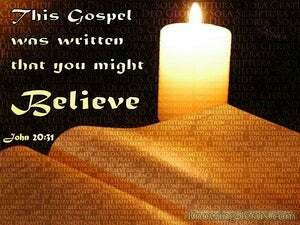 But these are written so that you might believe that Jesus is the Christ, the Son of God, and that believing you might have life in His name. 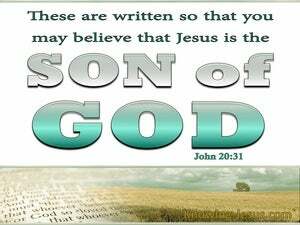 These are written that ye might believe that Jesus is Christ the son of God. 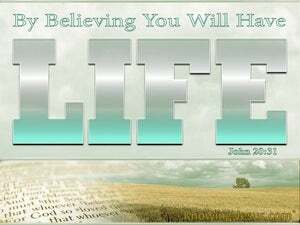 And that ye in believing ye might have life through his name. but these Signs are recorded so that you may believe Jesus is the Christ, the Son of God, and believing may have life through his Name. but these have been written that you may believe that Jesus is the Christ, the Son of God, and that by believing you may have life in his name. But these have been written, that ye may believe that Jesus is the Christ the Son of God, and that believing ye may have life in his name. but these are recorded that you may believe that Jesus is the Christ, the Son of God, and that believing you may have life in his name. but, these, are written, that ye may believe that, Jesus, is, the Christ, the Son of God; and that, believing, ye may have life in his name. but these are written, that ye might believe that Jesus is the Messiah, the Son of God; and that believing ye might have life through his name. But these have been recorded that you may believe that Jesus is the Christ, the Son of God--and that, through your belief in his Name, you may have Life. But these have been recorded, in order that you may believe that Jesus is the Christ, the Son of God, and that through believing you may have life, as bearers of His name. but these have been written, that ye may believe that Jesus is the Christ, the Son of God; and that, believing, ye may have life in His name. but these things are written, that ye may believe, that Jesus is the Christ, the Son of God; and that believing ye may have life through his name. 30 There were also a great number of other signs which Jesus performed in the presence of the disciples, which are not recorded in this book. 31 But these have been recorded in order that you may believe that He is the Christ, the Son of God, and that, through believing, you may have Life through His name. To Him all the Prophets bear witness, and testify that through His name all who believe in Him receive the forgiveness of their sins." in order that every one who trusts in Him may have the Life of the Ages." The thief comes only to steal and kill and destroy: I have come that they may have Life, and may have it in abundance. So the Tempter came and said, "If you are the Son of God, command these stones to turn into loaves." "You," replied Simon Peter, "are the Christ, the Son of the ever-living God." As for the Captain and the soldiers who were with Him keeping guard over Jesus, when they witnessed the earthquake and the other occurrences they were filled with terror, and exclaimed, "Assuredly he was God's Son." He who believes and is baptized shall be saved, but he who disbelieves will be condemned. that you may fully know the truth of the things which you have been taught by word of mouth. and that proclamation would be made, in His name, of repentance and forgiveness of sins to all the nations, beginning in Jerusalem. "Rabbi," cried Nathanael, "you are the Son of God, you are Israel's King!" He who trusts in Him does not come up for judgement. He who does not trust has already received sentence, because he has not his trust resting on the name of God's only Son. He who believes in the Son has the Life of the Ages; he who disobeys the Son will not enter into Life, but God's anger remains upon him. "In most solemn truth I tell you that he who listens to my teaching and believes Him who sent me, has the Life of the Ages, and does not come under judgement, but has passed over out of death into Life. For this is my Father's will, that every one who fixes his gaze on the Son of God and believes in Him should have the Life of the Ages, and I will raise him to life on the last day." And we have come to believe and know that *you* are indeed the Holy One of God." Jesus heard that they had done this. So having found him, He asked him, "Do you believe in the Son of God?" "My Lord and my God!" replied Thomas. while you are securing as the outcome of your faith the salvation of your souls. No one who disowns the Son has the Father. He who acknowledges the Son has also the Father. Whoever acknowledges that Jesus is the Son of God--God continues in union with him, and he continues in union with God. He who believes in the Son of God has the testimony in his own heart: he who does not believe God has made Him a liar, in that he has refused to accept the testimony which God has given about His Son. And we know that the Son of God has come, and has given us understanding so that we know the true One, and are in union with the true One--that is, we are in union with His Son Jesus Christ. He is the true God and the Life of the Ages. No one has God, who instead of remaining true to the teaching of Christ, presses on in advance: but he who remains true to that teaching has both the Father and the Son. "To the minister of the Church at Thyateira write as follows: "'This is what the Son of God says--He who has eyes like a flame of fire, and feet resembling silver-bronze.